The following guest post is from Nathaniel Beck, a political scientist at New York University. doesn’t capture the grim reality for recent college graduates, whose leg up on their less educated counterparts isn’t such a sturdy, comely leg at the moment. According to an Associated Press analysis of data from 2011, 53.6 percent of college graduates under the age of 25 were unemployed or, if they were lucky, merely underemployed, which means they were in jobs for which their degrees weren’t necessary. Philosophy majors mull questions no more existential than the proper billowiness of the foamed milk atop a customer’s cappuccino. Anthropology majors contemplate the tribal behavior of the youngsters who shop at the Zara where they peddle skinny jeans. Bruni makes two claims: half of recent college graduates are unemployed or underemployed, and that those who fail to major in business, engineering or the sciences will end up only asking if a customer will like fries with that. Bruni is not alone in citing the 53.6% number and the plight of the poor humanities major. The statistics was the “Stat of the Day” on the Atlantic’s web page of April 23, 2012. The source of this data is an analysis done for the Associated Press as reported in various newspapers under Hope Yen’s byline for the Associated Press (e.g. see here). 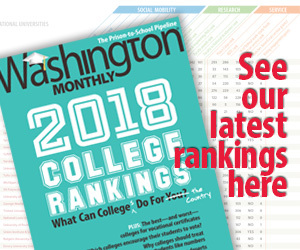 The analysis on which the AP story was written is based on research by Neeta Fogg and Paul Harrington of Drexel University in “Rising Mal-Employment and the Great Recession: The Growing Disconnection between Recent College Graduates and the College Labor Market” which appeared in Continuing Higher Education Review (2011, v. 75, pps. 51-65). Before looking at the report itself, it is only fair to note that another post in The Atlantic by Jordan Weissmann notes that in 2000 this figure was “at a low of 41 percent, before the dot-com bust erased job gains for college graduates in the telecommunications and IT fields.” Obviously an increase from 41% to 54% of recent college graduates being unemployed or underemployed is hardly trivial, but only Weissmann seems to have provided the comparison which shows that even in boom times, 40% of recent college graduates have troubles in the job market. Note that the 2000 figure is from before the dot.com recession, when the overall unemployment rate was about 4%. Since the unemployment rate if 2011 was about 9%, 40% of the increase in the job market problems of recent college graduates is due to the overall bad state of the economy and has nothing to do with college or choice of major. This is not to say the current economy is great for first time job seekers, but that we have not gone from heaven to hell for first time job seekers in the space of 10 years. Fogg and Harrington define underemployment (which they call mal-employment) as a college graduate not being employed in an occupation “which utilize[s] the skills and knowledge that are commonly thought to be acquired through a college education.” (p. 55-56). While that article does not specify what such occupations are, it does note that the occupations “generally include profession, technical, managerial and high-level sales occupations….” (p. 55). Of course many of these require an advanced degree, so recent college graduates under age 25 are unlikely to be eligible for such occupations. Is the current recession a falling off of a cliff, even if a smaller cliff than headlines scream? Fogg and Harrington’s Table 1 shows a mal-employment rate for college graduates under 25 of 34% in 2000, 34% in 2007 and 39% in 2010. Unemployment was only 4.5% in 2007, so the increase in mal-employment from 2000 to 2010 is not simply a consequence of the current recession. Headlines make the United States look like Spain; the situation is not good, but we are far from Spain. Using the same American Community Survey for 2009 and 2010 as Fogg and Harrington, but focussing on actual unemployment by major, Carnevale, Cheat and Strohl (Hard Times, Georgetown University, Center for Education and the Workforce, 2011) have similar findings (p. 7). 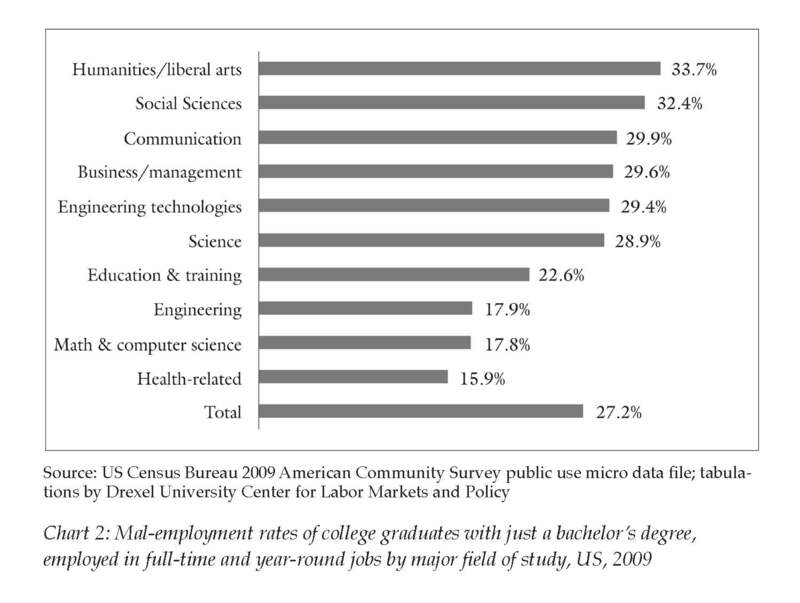 Recent college graduates with a business major have a 7.4% unemployment rate, those with an arts degree have an 11.1% rate (with social science majors having an 8.9% rate and humanities/liberal arts students having a 9.4% rate). Combining these two studies, it is clear that being an arts major does not compel one to, at best, discussing supersizing with customers, nor does being a business major totally guard against that. Yes, business majors do better in the job market, and they make more money in their entry level positions than do arts majors ($39,000/yr vs. $$30,000/yr), but is this enough to tell everyone to flock into undergraduate business schools? Engineers and computer scientists have even higher entry salaries (about $50,000/yr) but can student thinking contemplating their major at age 18 (or even age 12) all of a sudden give themselves the skills necessary to do computer science? In brief, the current job market is bad for everyone, including recent college graduates (and other youth seeking a first job), and the costs of long term unemployment or underemployment are high. But it is not responsible to tell college students that their lives will be terrible unless they study engineering, and that the career prospects or current college graduates are orders of magnitude worse than a decade ago. Neither of those statements are consistent with current data.